touring on a sportsbike. Or cruiser. or even a tourer. . . I have a confession to make. I first bought and installed a Ventura luggage system on my ZX7-R in 1997. I've been sitting on, or rather just in front of, this little gem for sixteen years and not got round to sharing. Ladies and gentlemen, I apologise. I am writing slowly because I can't see the screen while my head is hung in shame. But allow me redress this terrible oversight now. First of all, some background. 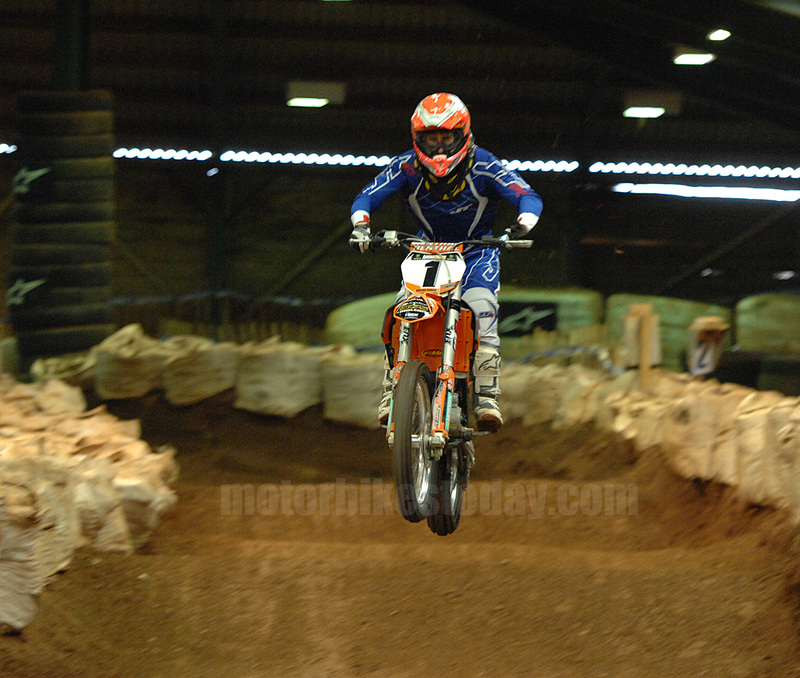 Back in, oh, about 1996 I had cause to leave London late on a Friday evening and ride down to the West Country. The ride took in all sorts of strange other places because I was assisting with an overnight classic bike run, but then I was going to visit some friends and stay down in Devon for the bank holiday weekend before coming straight back to work on Tuesday morning. This is important, because it meant that I needed to take more than the usual tee shirt, couple of pairs of pants and a toothbrush. I actually had to, shock horror, pack. Now this was resolved by the use of a pair of stout and (I thought) good quality throwovers. I got everything I needed into the bags without too much of a hassle and shot up into town on Friday morning. So far, so good. The first problem arose when I needed to filter, because my stuffed full throwovers were a bit wider that I was used to carrying. Quite a bit wider. I probably also need to apologise to anyone whose car or van was assaulted by a loon on a 600cc Kawasaki on the way to work all those years ago. The problem was worse when it was time to leave. Partly because it was a bank holiday weekend, which meant a (slowly) rolling roadblock all the way out of town and down the M40. Partly because it was a bank holiday weekend, so naturally it was raining. 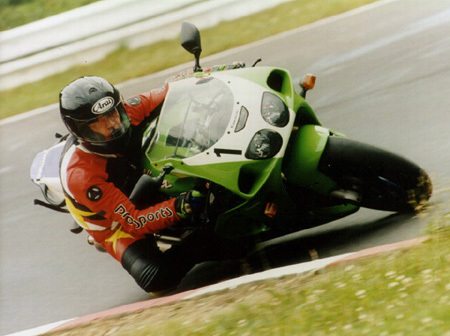 And partly because when the traffic eased a bit and I was able to open up slightly, the aerodynamics of the panniers meant that my normally rock stable Kawasaki became a mobile chicane. And then the rain covers blew off, so all my stuff got wet as well. It wasn't the most comfortable weekend, nor was I my normal raffish self when I got back into the office. And so my quest began to find A Better Way. A quest that was solved around the same time I traded the ZX-6R for a bright green ZX7-R. Back in the dark ages of The Internet there was no Google search, and it required some deep questioning on some international newsgroups and bulletin boards (don't worry - you can Google them) to get answers. And the answers all pointed me in the direction of Dold Industries in Hamilton, New Zealand, and their newly developed Ventura Bike Gear. My search was followed by a phone call to New Zealand where an extraordinarily helpful chap sent me, in exchange for a hefty chunk of money, a couple of bags and a fitting kit for my ZX7-R. Just in time for me to go to the Nurburgring with it, i fact - a common thread that may well reappear from time to time. Now this lengthy discourse may seem like no more than padding, but that's not the case. It's important because, though the initial outlay may be quite high, at least some parts of the kit are transferable between bikes, and the bags - which are the most expensive - are universal. Not only that but mine have lasted thirteen years of fairly robust treatment so far without issue. But I'm getting ahead of myself. These days, Ventura have a proper UK importer and everything. And the Internet being what it is, you can simply visit their website, choose the make, model and year of your bike and they will tell you what you need. Then it's just a case of choosing the bags to go with it and you're sorted. 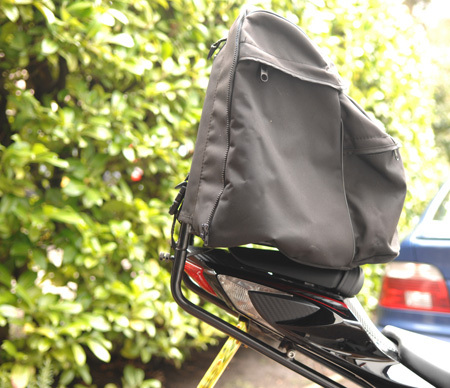 A modern sportsbike, starting from scratch and giving you the same bags that I currently have (or the current equivalent, anyway) will set you back a total of about £400, delivered to your door. That's a rack, a grab handle, a mounting kit and two bags. And actually it's not that expensive compared to hard luggage, which is less flexible. In every sense. What do you get for your money? That rather depends on you. 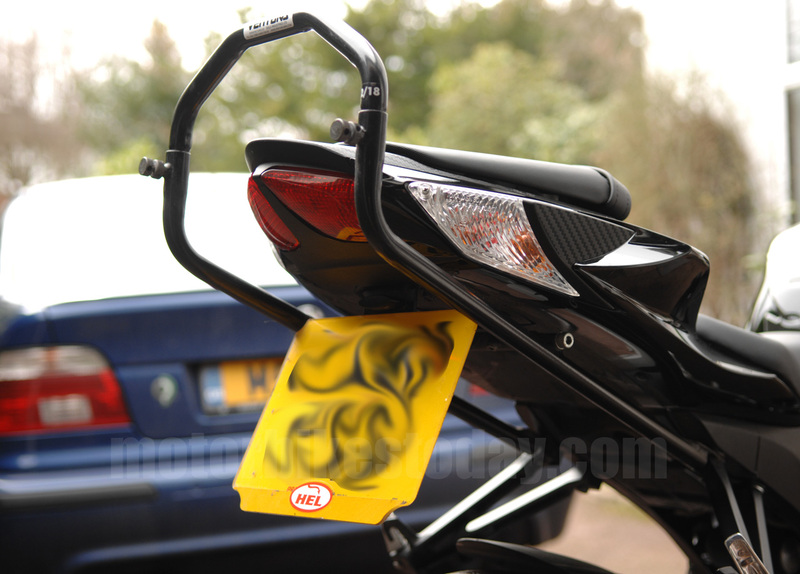 As a bare minimum, you'll get a pair of side rails which usually use rear footpeg hanger mounts as their front points and something like the number plate bracket as a rear mount. They are roughly L shaped, and the backs stick up. They are also hollow, and the rack itself slots into them, being locked in place with a large screw retainer on each side. There are a couple of different racks available as well as a grab handle for when you're not carrying luggage. So far, so conventional. This is where it gets clever. The racks are normal small racks except that the grab rail type section you usually find on the front is elongated. Depending on which rack you choose it could be elongated quite a lot. The bags have a large pocket on the flat, back side. The extended loop on the rack slides into this pocket and the bag clips to the rack with a couple of short straps. The real beauty is that if you're riding solo you put the bag on facing forward - it's on top of the pillion seat and it makes absolutely no difference to your bike's handling, stability or width. I guess if you really take liberties with the amount you put in it then it'll feel like you've got an unusually well behaved oompa loompa riding pillion. Not normally a problem. But it gets better. Oh yes it does. Because the bags zip together, so if you have a lot to carry you simply put the larger bag facing forward and the smaller one on the rack facing aft. That gets you eighty litres of luggage, and if that isn't enough then frankly you need a car. 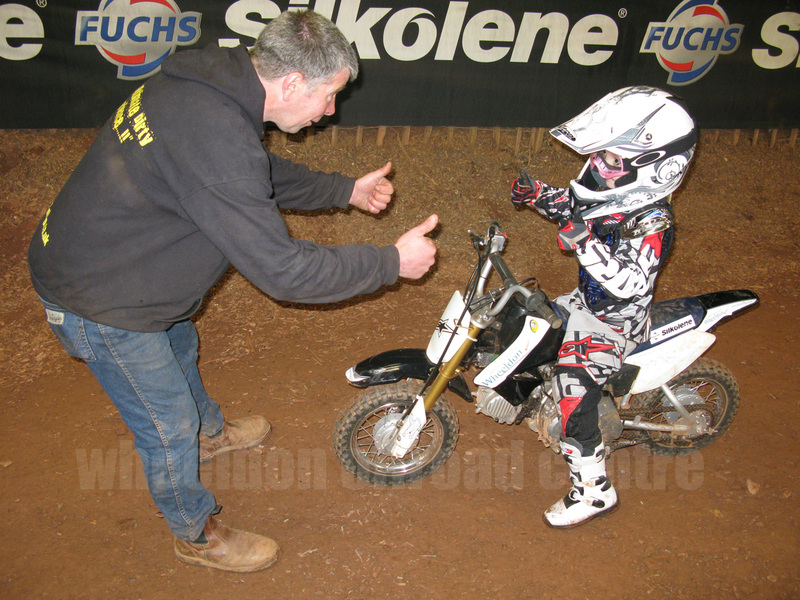 If you need to take all that kit and a pillion, turn the bags around so the smaller one faces forward. It'll be a bit cosy but it may just work. Then again, it may not - no system is perfect, right? There's more cleverness to come. The bags have D-rings attached to them and come with optional shoulder straps. Proper ones. So if you need to take your bag with you you can carry it like a rucksack, which again makes life easier. They have proper rain covers as well. Rain covers that stay on at high speed. The later versions of the bags have slightly more accessible pockets, I believe, but the principle has never changed. In use, once the rack is fitted then it's dead simple. The smaller bag is big enough for my laptop and paraphernalia, shoes, normal jacket and other bits and pieces. The larger bag will take all that plus most of my camera gear. For last year's Nurburgring trip I used both bags and took two video cameras with chargers and bike mounting gear, my still camera and a couple of lenses, laptop and charger, race boots, spare gloves, waterproofs, trainers, toilet gear and clothing for four days. There was plenty of room to spare. On the autobahn I had my GSX-R up to an indicated hundred and sixty miles an hour with no sign of any unhappiness from the back. Now the book says to stay, I think, below the ton. They have to say that - I don't. I'm not saying that you'll be fine going faster, merely that I always have been. The Ventura Bike Pack System has been on test with me since before the Internet existed properly. The bags have been used hard, left wet, allowed to get mouldy on one occasion, dropped, scuffed, overloaded...and they've never let me down. The racks have been changed with different bikes because they don't necessarily fit. 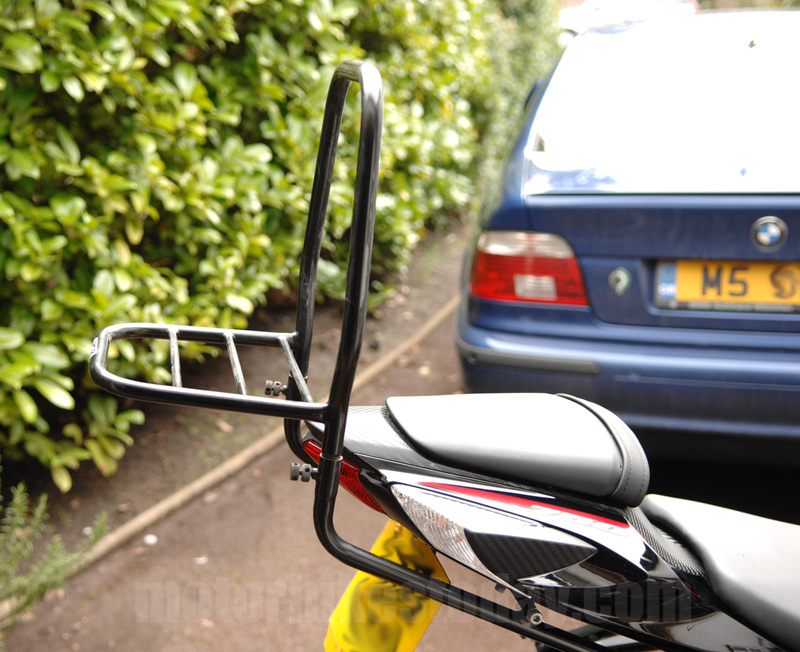 there are three or four different width racks as well as the different L brackets so while you may be lucky and get to hang onto the rack when you change bikes (in which case you'll only spend about £50.00 on the L brackets) you may need to change it all. Except the bags, of course. But anyway, even the things I've needed to change have been with me for around sixty thousand miles before being swapped out. They've never rusted, cracked or otherwise failed. This is seriously good kit. So here's the thing. There are very few products that I would absolutely, unreservedly endorse. The Ventura Bike Pack isn't pretty. It isn't especially cheap. But it is spectacularly, unreasonably, effective. And the initial expense disappears when you factor in, say, a decade and a half of daily use. And for those reasons, this is one product that I would urge anyone looking for luggage to seriously consider. In fact, if you ride your bike to work, go out at the weekends or ever consider even casual touring then I'd recommend it absolutely. Because it is, quite simply, the best single bike related item I've ever used.